With Schlage Touch, no key means there's nothing to lose, nothing to fiddle with, andfor intrudersnothing to pick. All in a slim profile that's every bit as sleek as it is strong. When you take out the key, it's amazing what all you can add. The Schlage Sense Smart Deadbolt with Century Trim in Satin Nickel makes daily life easier and more convenient. Enter an access code on the touchscreen to unlock the door instead of searching your pockets for keys. Pair the lock with your smartphone over Bluetooth.. Share access with trusted friends and family with just a few taps in the Schlage Sense app no more keeping track of spare keys. The Schlage Sense lock is easy to install yourself in minutes. It's battery operated so there's no hardwiring required, and the lock will still accept access codes if the power goes out at home. You can update the lock wirelessly through the app as new features are released, which means you never have to buy a new lock to take advantage of the latest capabilities. Add the Schlage Sense Wi-Fi Adapter (sold separately) to your home Wi-Fi network to lock/unlock from anywhere on Android smartphones, iPhone., iPad. or iPod touch.. Or, if you have an iPad./Apple TV. connected to your home Wi-Fi network, you can control the lock from your iPhone as part of your HomeKit-enabled smart home. The Elements Series provides an expanded choice in Fashion Doorware at an affordable price. Amador has a refined, structural look with its simplistic modern design. 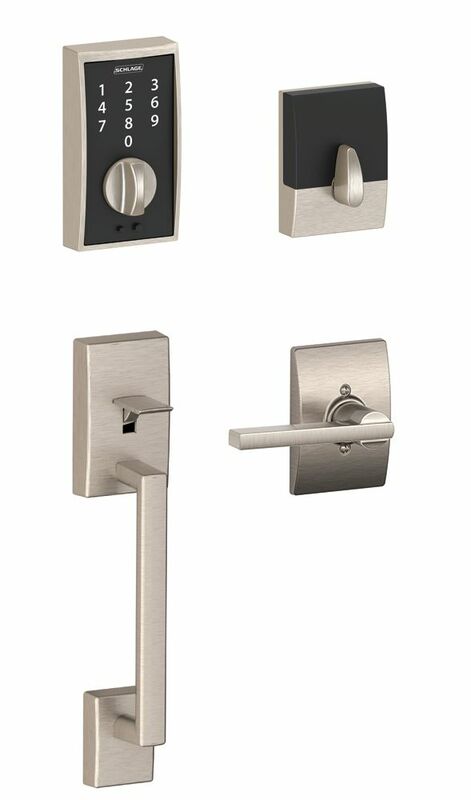 Priced affordably, this handleset offers achievable style while maintaining superior security. The crisp, clean appearance of the Satin Nickel finish adds to the overall look of the product and brings a modern feel. Welcome Home Series<sup></sup> product offers stylishly designed door hardware that provides maximum-security protection. The curved and rectilinear lines of Hawthorne make a beautiful exterior complement to many design styles. Handleset can be locked or unlocked by a key from the outside or with a key/turnpiece from the inside. The crisp, clean appearance of the Satin Nickel finish adds to the overall look of the product and brings a modern feel. Century/Latitude Satin Nickel Keyless Entry Touchscreen Lever Handleset With Schlage Touch, no key means there's nothing to lose, nothing to fiddle with, andfor intrudersnothing to pick. All in a slim profile that's every bit as sleek as it is strong. When you take out the key, it's amazing what all you can add.